Every Car On Your Lot Guaranteed To Pass Emissions Test Everyday! Do the cars on your lot have the power and performance to sell? By delivering a more complete burn of the fuel, RxP effectively de-carbonizes the combustion chambers, plugs and fuel injectors. Add to gasoline or diesel engines. Eliminates black smoke in diesels. RxP is guaranteed to reduce your cars tailpipe emissions so they pass the test everyday! 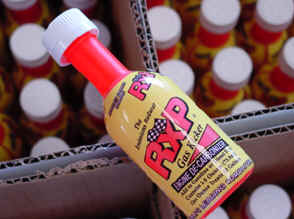 Give your cars the power and performance they need with RxP – the big fuel additive in the little red bottle. Ask how you can add profit by offering RxP on your service lanes.